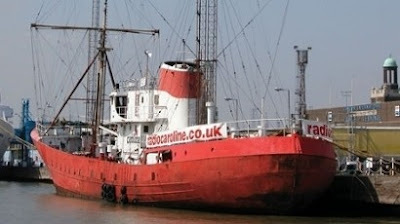 Legendary offshore station Radio Caroline will hold a rare AM broadcast over the bank holiday. Radio Caroline was set up in 1964 and spent years broadcasting on medium wave, from a ship on the high seas off the British coast. The station now broadcasts legally through Sky Radio channel 0199 (on the Astra 2) and internet site www.radiocaroline.co.uk. The ship is moored at Tilbury Docks. From Friday to Monday (31st August) it will broadcast to Essex and Kent on 531AM. Peter Moore, 62, who now manages Radio Caroline, said: “We had to broadcast on AM in the past because FM, satellite radio and the internet didn’t exist.” Monday we also commemorate the fact that 35 years ago the offshore stations Radio Veronica, RNI and Atlantis were silenced off the Dutch coast.